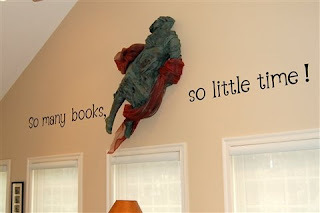 This was a project for a library - the homeowners wanted something related to books but not too long or serious - we ended up with "So many books, so little time!" I used Alphalicious at 6 inches to design this - I like the whimsical nature of this font. I discovered that there is no comma on Alphalicious so I used the one from Plantin Schoolbook. Here is the view as you enter the library from the most frequently used door. The number of letters is nearly the same in each phrase but the first part has wider letters (the "m, n and o" are all much wider than the "l, i and t" so it is difficult to get the spacing to work and look balanced. We ended up choosing to keep the spacing from the sculpture in the center consistent which made the first phrase extend a greater distance to the left than the second one extends to the right. Since the room is usually entered from this door, the eye is fooled and it looks like the length is about the same due to the angle at which it is viewed. The capital "S" in Alphalicious is rather short and looks a bit funny (like it might be upside down) so we tried it both ways (flipping the "s" top to bottom) but ended up keeping it as the font is designed. Painter's tape is very helpful for keeping your lines straight - of course you do have to get the painter's tape on straight to begin with! I used 12 inch rulers propped on the top of the window trim to place the tape. Next time I will try a laser level - that also reduces the risk of a faulty spot in the wall paint lifting when the painter's tape is removed. I used Design Studio for this project but it is not necessary to have it to do wall words. Using Design Studio just helps you to conserve the amount of material you use since you can lay out the letters to fit tightly together before cutting. 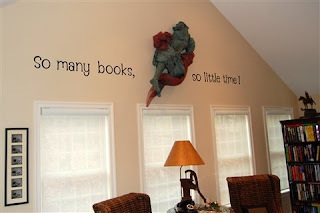 I was able to get the entire saying to fit in five feet of 6 1/2 inch "wall pops" material. I also used my 24 inch mat for the first time and this helped to get the letters fit together tightly since I had more room on the mat to "play" with the positioning. When adding letters randomly like this is is easiest if you write out your phrase and cross off the letters as you add them - this insures that you cut all the letters you need since they are out of order and it is hard to keep track otherwise! Below you can see the "leftovers" - there is some room here to cut out a few more small things so they are in my "save" pile for now! If you didn't see my earlier post about cutting wall pops in the Expression (February 5, 2008) I will repeat the cutting information here. I have been very happy using blade depth 4, medium pressure and medium speed - the wall pops material is cut cleanly and the backing remains intact which makes it easy to remove from the mat and to transport to the place you will be posting the words. It is important to smooth down the material and get all the air bubbles out before cutting. No cut file posted this time since everyone will have different ideas about what they want on their walls - I just wanted to show you another idea. (If you want to copy this exact phrase you can email me to send the file to you - contact info is in the right column at the top). Have fun changing your walls to fit your mood! I love the snowflakes! I don't about you but I am really ready for Spring!! The words you did -- are great - thank you for the ideas on how to put them on the mat - I have brought all the wall pops but been nervous about actually doing it! *smile* Afraid I screw it up - your blog really helps me learn. Thank you for so generously sharing your files and talent - it really means a lot - You are a special special lady! The words on the wall are so nice looking. I appreciate you showing how to put the letters on the mat. Great idea! I really like how you utilize all of the vinyl. The book quote is great!